Apple has released iOS 7 beta for download for registered developers. As announced earlier today at WWDC 2013, the next iteration of Apple’s mobile operating system has been completely redesigned with a new interface and features. Along with this afternoon’s release of iOS 7 beta for the iPhone 4, iPhone 4S, iPhone 5 and iPod touch 5th gen, allowing developers to test out the new features of the operating system. 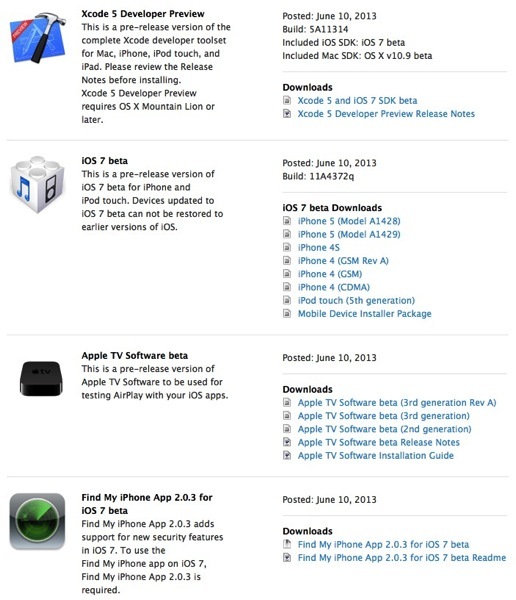 There are new beta versions of Xcode 5, Apple TV software and Find my iPhone 2.0.3. The public release of iOS 7 is slated for the fall.